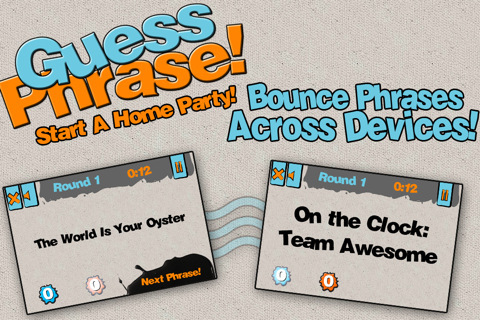 Guess Phrase is a gaming app that is played in groups with the challenge of guessing phrases by using hints. The app costs $0.99 and was released by Mobile Data Solutions Inc. for an iPhone, iPod Touch, and iPad but requires iOS 4.1 or later. Guess Phrase is a concept born from the Hasbro game Catch Phrase, which is essentially the same thing: A word-guessing party game. The biggest challenges posed in Guess Phrase are that it is timed and there are specific guidelines outlining the game play. In order to play fairly, a player may not use words that rhyme with the phrase, use any part of the phrase, or tell their teammates the first letters of the phrase. The game comes with two modes to play: Classic and Free. In Classic, you will need to find friends to play with because it requires two to four teams to be pitted against each other to play a series of rounds. If you want to play in Party Mode or Classic, you can host or join a game from the Guess Phrase network. In Free mode it is just you and your wit against an onslaught of murky phrases. If you want to skip one you simply swipe the screen. In Settings, you can change the difficulty or the categories, and create or buy new phrases. Guess Phrase does not skimp on phrases, there are 14,000 to be exact, split into 8 categories. If you love your music and cannot live without it, it will be a comfort to know that you can play your iPod from inside the app. In the original game, Catch Phrase, the player giving hints could use gestures to convey the mystery phrase, but that element has been somewhat cut out with Guess Phrase. If you still do not quite understand the dynamics behind this game, think of a less fun version of the game Taboo. I am more of an Apples to Apples person so I did not get much out of Guess Phrase but it does serve its purpose. There are countless phrases and people available to play with (if you are stumped when trying to put together teams). AppSafari review of Guess Phrase was written by Vanessa Paszterko on March 13th, 2011 and categorized under App Store, Games, iPad apps, Multiplayer, Music, Puzzler, Universal. Page viewed 4037 times, 2 so far today. Need help on using these apps? Please read the Help Page.